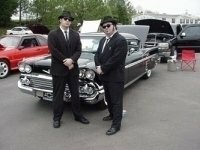 Blues Brothers Celebrity Look Alike Impersonators. 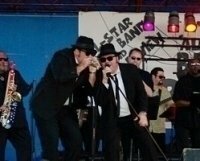 When these Brothers , claim they’re the only Blues impersonators in the state and, to their knowledge, the only impersonators nationwide who are actual brothers, its hard to dispute it — especially when it’s said with a stern expression topped with night-black Ray-Bans. Unlike the characters musicians/actors John Belushi and Dan Aykroyd made famous by the 1980 movie that sets the record for most cars wrecked in one film, these Brothers never spent time behind bars. One Brother, 25, has an associate degree in criminal justice and now performs the Blues full time. The other Brother, 33, is a Psychiatric Nurse at Decatur General Hospital. He is a web designer and commercial graphic artist when not promoting “The Band”. Internationally renowned tribute act The Blues Brothers Tribute Band have been performing their high energy act for years to amazed audiences at home and abroad, at over 1000 shows, in the inimitable and enduring style of The Blues Brothers. 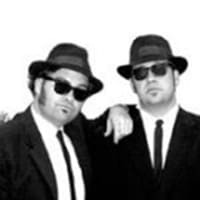 The Blues Brothers Tribute Band recreate the energy, excitement and atmosphere of a show by The Blues Brothers Band with John Belushi and Dan Aykroyd performing as their characters ‘Jake & Elwood Blues’. 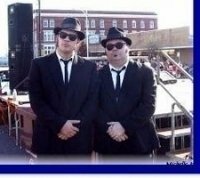 From the duo show, to the 4 piece playback band and 6 piece live band, up to the full 8 piece show band, this highly professional tribute to the music of The Blues Brothers can cater for any event, of any size!